You’ll find hundreds of breathtaking waterfalls in Pennsylvania, and the Poconos is the epicenter of the action. From the towering "Niagara of Pennsylvania" to the Keystone State’s tallest waterfall, you’ll find many impressive cascades in this scenic region of the state. These seven spectacular falls will be the highlight of a trip to the Pocono Mountains. Located in the Delaware Water Gap National Recreation Area, Raymondskill Falls is the state’s tallest at 150 feet, and only a few feet shorter than Niagara—if you add the height of its three tiers together. To reach it, follow a steep, uneven 0.3-mile trail to reach two epic viewing areas, one above the falls and one in the middle. A pool separates the top two drops from the bottom one, and it’s worth visiting both viewpoints to get different perspectives. One of the Poconos’ best waterfall walks is also its most challenging. Abutting the land of Lehigh Gorge State Park near the town of Jim Thorpe, this trail on state game lands is less maintained than state park trails and has some steep, slick spots. Wear proper footwear and use caution on this waterfall-studded hike that takes you past Chameleon Falls, Glen Onoko Falls, and Cave Falls before ending at the top of the gorge. You’ll climb over rocks, through trees and blooming rhododendrons then up, up, up to see all three falls. This 4-mile hike is a doozy, but worth it to see these beauties. 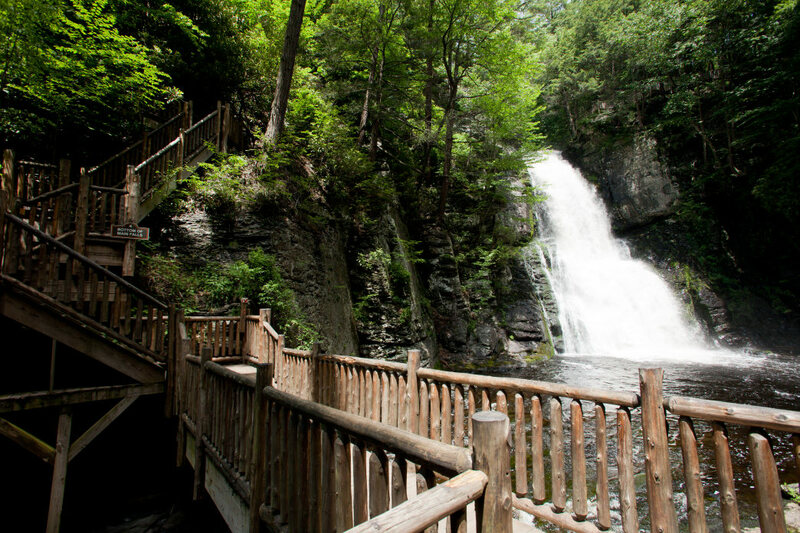 Bushkill Falls require climbing some stairs, but you’ll be rewarded with a great view of one of the most impressive waterfalls in the state. Nicknamed the "The Niagara of Pennsylvania," Bushkill Falls is a group of eight natural waterfalls inside a 300-acre privately owned park near Delaware Water Gap. Pay an entrance fee to explore the park’s two scenic miles of trails, boardwalks, and bridges. Follow the trails to the Main Falls, which cascade down 100 feet into a gorge below surrounded by ferns, moss, and wildflowers. The falls trails are welcoming to families, but the walks require some stair climbs due to the 300-foot drop from the first falls to the lower gorge. Get two waterfalls for the price of one on this easy walk along the Lehigh Gorge Trail—just upstream from the Rockport Access Area. First up is Buttermilk Falls, a 50-footer that cascades down a rocky ledge surrounded by lush vegetation. Park in the small lot and follow a .3-mile path across a bridge to get a wide-open view of the falls. After checking out Buttermilk Falls, continue back downstream past the parking area for .3 miles to Luke’s Falls. Stop on the bridge for a great view of this 50-foot fall descending a series of drops. Because of the thick vegetation, this cascade can be tougher to see in the summer, but you’ll find excellent views in winter and early spring. For those averse to long hikes, Buttermilk Falls and Luke’s Falls offer quick access from easy-to-navigate trails. This lake-fed fall is impressive year-round. Thundering down the State Game Lands off Route 6 you’ll find this stunning, roaring waterfall along Shohola Creek below Shohola Lake. 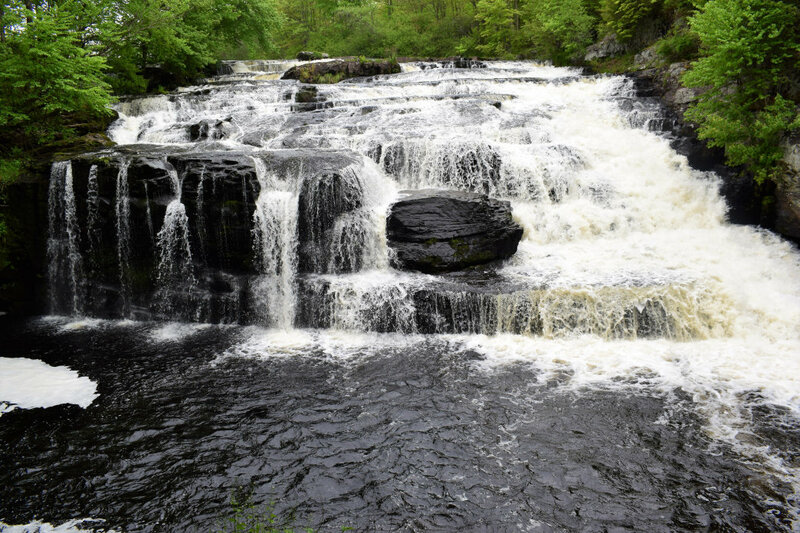 To get there, follow a lesser-visited 0.8-mile loop trail through the marshlands to one of the Poconos’ most impressive and underrated waterfalls. The sheer volume of water flowing from this lake-fed fall is impressive year-round, and the dam above it seems to play little role in how fast and fierce it’s flowing. The best views are found from a ledge in front of the falls, but you can also see it safely from both sides of the creek and at stone observation areas on the west side. The western Poconos’ Hickory Run State Park is home to the rushing waters of 25-foot Hawk Falls. To get there, park in the lot on Route 534 and take the 0.6-mile Hawk Falls Trail. This forested route was once used by wagons traveling from the town of Jim Thorpe and is thick with rhododendrons in summer. As you near the falls, cross a wooden bridge over Hickory Run. Continue downhill to a rocky area off the trail to see Hawk Falls. Hike to the bottom for another view, or to take a dip in the cool, refreshing water. The park offers hiking trails like the Switchback Trail, Shoreline Trail, Fireline Trail and Woods Trail.